Encyclopedia of Witchcraft is a comprehensive celebration of all facets of witchery and the magical arts: from fairy tales to familiars, hags to healers, Ancient Egypt to modern Hoodoo, Wicca and Neo-Paganism, from New Orleans Voodoo to the Golden Dawn, this definitive reference book reveals and explores the many faces, facets and diverse traditions of thousands of years of witchcraft. INCLUDED ARE RECIPES FROM THE WITCH’S CAULDRON, AUSPICIOUS DATES FROM THE WITCH’S SACRED CALENDAR, AND SPELLS FROM THE WITCH’S GRIMOIRE. Explore the botanicals historically most associated with witchcraft and the animals historically considered most likely to be familiars or witches in disguise. Discover how witches have inspired fine art and mass entertainment from Shakespeare to Harry Potter, and how witchcraft has been depicted in various ways, from veneration to defamation. Meet the fascinating practitioners and adepts included in the Witchcraft Hall of Fame. Journey to the Burning Times, those terrible centuries when those deemed witches were persecuted, oppressed and murdered: situations that still exist, in some places, today. 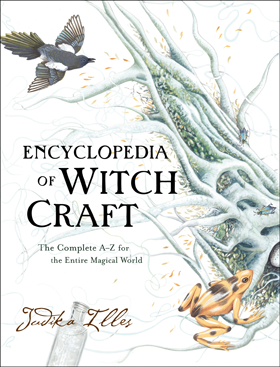 A combination of instruction and entertainment, Encyclopedia of Witchcraft is packed with legends, lore, magic spells, potions, recipes, and rituals.